Amy Winehouse’s father Mitch Winehouse broke down during an appearance on an American chat show yesterday, as he gave the first emotional interview since the singer’s sudden death. 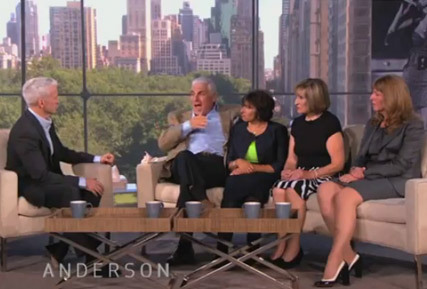 Appearing on US journalist Anderson Cooper’s show – alongside Amy’s mum Janis, great aunt Rene Selner and other family members – Mitch spoke of his struggle to come to terms with his daughter’s death, and how he is convinced her spirit was present at the funeral. ‘When I did the eulogy at her funeral, as I got up to speak, a black butterfly came in,’ he said. ‘I had my head down because I was reading, and I could hear people muttering and I thought the paparazzi had got in. During the interview, the late singer’s father also spoke about Amy’s battle with alcohol, and how he suspects a seizure brought on by detoxing could have caused her death. ‘She’d been clean for around about three years, her problem was alcohol,’ he told the show host. ‘The last few years of her life she was prescribed Librium, which is a normal drug, which is given to people who are detoxing and it kind of decreases the chances of having seizures. ‘She was continuing to take one of those pills everyday.